I am so excited over the sharing a SNEAK PEEK of just one of Eileen new dies that will be RELEASE at Creativation 2017!!! This die will be in every Paper Crafters Stash for sure! 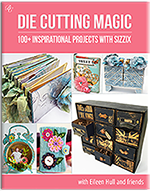 It is one of those Sizzix Dies that you will have unlimited creativity with not just for yourself but as also to use as a fabulous gift!! !